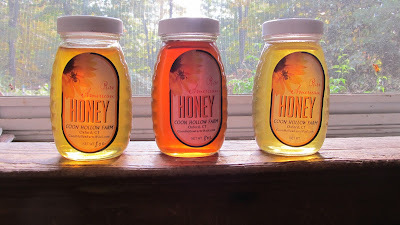 I posted a picture of the two honey harvest that I did to compare the different colors some months ago. 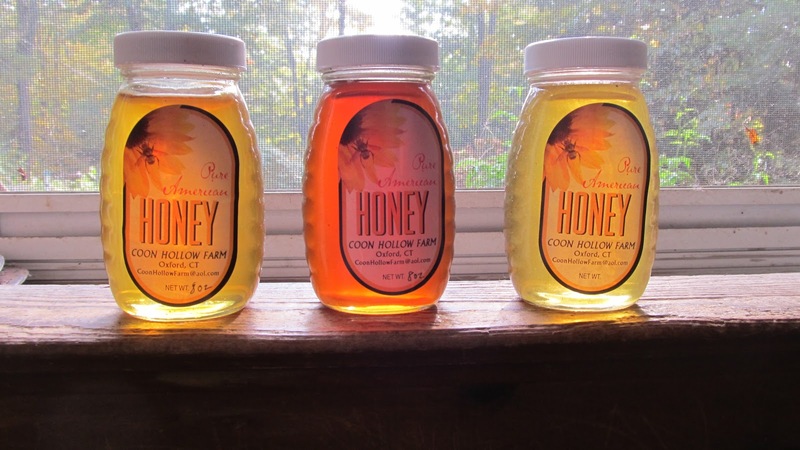 When I was closing down the hives and preparing them for the cold months ahead I was able to harvest just a small amount of honey (sorry we have none left). I thought I would share the colors, the final harvest is on the right and the color is so lite. This time of year they are mostly visiting plants like Goldenrod and Asters that are light in their pollen and nectar. Hello, really interesting, think bee keeping is so terrific. Love all the colors, so pretty, so yummy to. Blessings Francine. wow, i had a lot to catch up on! you have such a neat farm with lots of fun things to see and do. wish i lived close! i think im going to refill my coffee and scroll thru one more time! enjoy your weekend!